Pinchbeck, sometimes called Pinch, is a metal alloy that you won't encounter in today's jewelry. You might hear the term used to incorrectly describe base metal, gold-filled or gold-plated jewelry. Pinchbeck is a durable yellow metal that resembles gold but is made with a combination of copper and zinc...much less zinc than the combo of the same two metals used to produce brass. The formula was developed by Christopher Pinchbeck, a London clockmaker who lived from about 1670 to 1732. 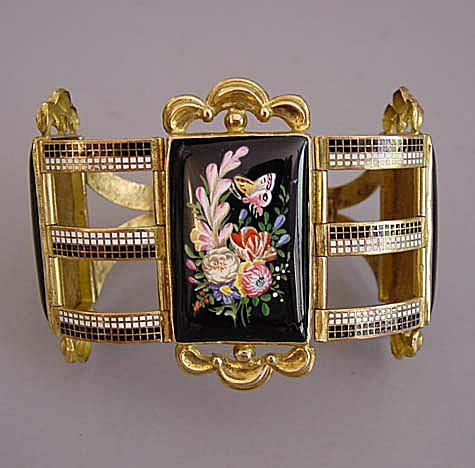 Pinchbeck was an affordable substitute for gold, and records indicate that travelers who were at risk of robbery from highwaymen often carried jewelry and accessories made from Pinchbeck and other similar metals, rather than travel with their more expensive pieces. Pinchbeck could be worked into the same intricate designs as gold, and it retained its yellow color--other gold substitutes of that period were prone to fading. The family kept its exact formula a secret, but others guessed the alloy's two components and began to experiment with their own mixes, some more successfully than others. In 1733, Christopher Pinchbeck's grandson placed an ad to alert the public that items being advertised and sold by others were not made from the family's formula; the metal had become so popular that false claims were rampant. The same ad named items that the family produced, a long list that covered more than clocks, watches, and jewelry. Swords, tweezers, snuff boxes, forks, spoons, buttons, belt buckles and more were all crafted by the Pinchbeck family. Others tried to pass off jewelry made from their own formulas as gold, but the Pinchbeck family always made it clear that their metal was a substitute. Over time, the term Pinchbeck was often used generically to refer to all types of gold substitutes. Pinchbeck's popularity declined in the mid-1800s, when nine karat gold (which contains 9/24 parts gold) became legal, allowing buyers to acquire jewelry made from a less expensive version of that precious metal. About the same time, electro-gilding (a plating process) was invented, adding to Pinchbeck's decline. Jewelry made after 1840 is not likely to be crafted from Pinchbeck, so accurately dating a piece is one important way to help determine if that specific metal was used. Other gold substitutes of that age will probably be faded, another clue to identification. Pinchbeck items do tarnish over time. Examining pieces you know are authentic can help you recognize Pinchbeck items you might encounter at estate sales; those finds are not common, but they do occur. Consider buying jewelry marketed as genuine Pinchbeck from a dealer you trust.